Is there a better alternative to CloudPlay? Is CloudPlay really the best app in Audio category? Will CloudPlay work good on macOS 10.13.4? 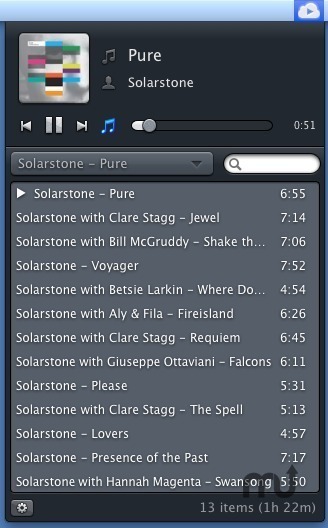 CloudPlay is a menu-bar music player that plays local music in iTunes and also searches for music on YouTube, SoundCloud, exfm, Jamendo, and other sites. Make playlists by combining music from different sources. It's like Spotlight for music. Break free from the menu bar! Click anywhere on the background and drag to make CloudPlay appear in its own window. Want to move it back to the menu bar? Just drag it back to the top of your screen. Reminder: To search for SoundCloud or YouTube users or artists, select the Channels drop down in the search field. Improved streaming performance when playing in "repeat one" mode. Fixed bug that caused removed playlists to reappear when the app was restarted.